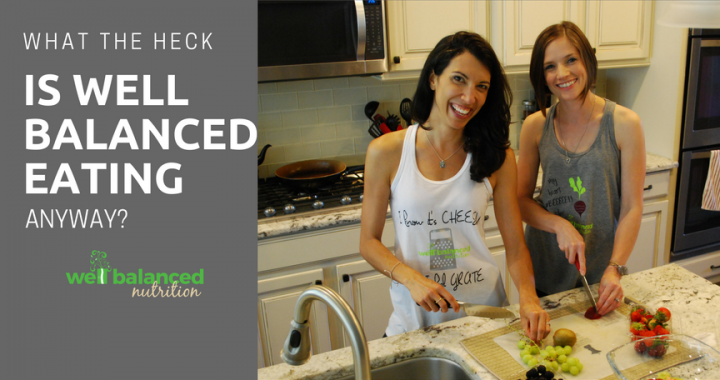 Kristen and I talk a lot about eating well-balanced, but unless you have sat down with us or heard the Well-Balanced Plate talk you may be wondering… what does that mean? After reading countless research articles, books such as The Blue Zone Solutions, and a combining over 20 years of professional nutrition experience, Kristen and I recognize the benefits of a mostly plant-based diet incorporating protein, complex carbohydrates, and healthy fat. Eating them in the proportions shown on the Well Balanced Plate helps you feel full and satisfied, not deprived and ridden with cravings. When we eat foods from nature in this way, we can start to trust and rely on our body and mind to remind us what, how much and when to eat. 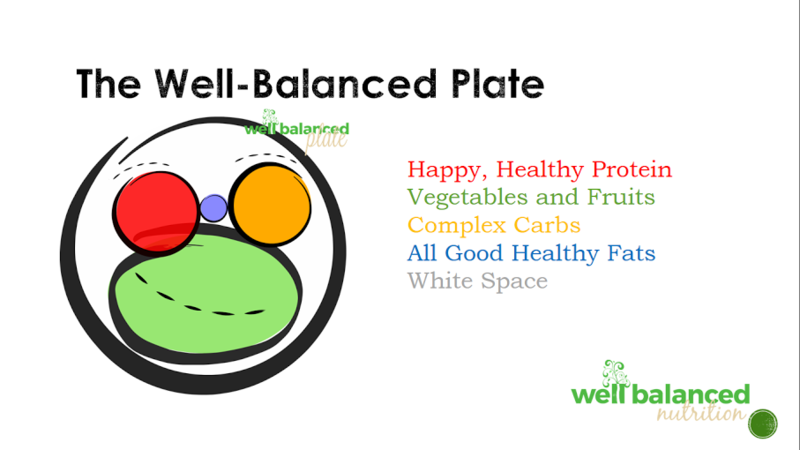 The Well-Balanced Plate was created to visually represent a balanced meal or snack. Five populations in the world have the highest concentration of centenarians, people living over 100-years, and they all have something in common: a plant-centric diet. You can read all about their lifestyles in the Blue Zones. Many people who’ve read the book assume you have to be a vegetarian to live a long, vibrant life. In actuality, four of the five communities eat animal protein on a regular basis; however, they make meat more of a side-dish rather than the main course. You’ll notice that the largest section of the Well-Balanced plate is for vegetables and fruit, not meat or carbs. By filling half of your plate with non-starchy vegetables and fruit, you will not only fill up on fewer calories, but also (and most importantly) get the health benefits of vitamins, minerals, fiber, and phytochemicals. Kristen wrote more about the benefits of fruits and vegetables in an earlier post and encouraged eating a variety. America is a melting pot of ethnic cultures which means we have many food options at our fingertips. Eating healthfully doesn’t have to be boring. Change things up and try a new vegetable or a different way of cooking, such as implementing Meatless Monday or trying an ethnic dish. It’s not perfect. It’s flexible and enjoyable. It’s more mindful and less impulsive. Mindful eating strategies can help us become normal eaters and avoid the point when cravings, emotional eating, and daily life can consistently lead to unhealthy choices that leave our bodies fed but undernourished. Lucy shared HALT, an acronym to explain why our poorest choices tend to happen when we are hungry, angry/frustrated, lonely or tired, and Kristen shared how gathering some DATA can help you cut back on sugar. Another mindful concept is what we call “20% white space“, where we purposefully give ourselves time to check in with our bodies to determine if we are still hungry. Every time you eat is an opportunity to practice being well-balanced. Eventually, you will no longer have to try so hard because you have practiced for so long. It means ditching the diet and striving for self-care. The media keeps reminding us that two out of three American adults are considered overweight or obese, and there’s this pressure to be thin like the women we see in magazines. This messaging, along with the fad diet industry, is creating a culture full of body shame and food guilt. That feels demoralizing. Many people come to Well-balanced Nutrition with a goal to lose weight. We know that diets don’t really work. Instead of focusing solely on the food, we help people identify the behaviors and patterns that prevent them from reaching a healthy balance. We talk about making small behavior changes to create a compound effect which will result in more energy, confidence, and yes, typically a lower number on the scale. We use weight as a tool, but with the understanding that weight is only a small part of your health picture. Ultimately, we want our WBN tribe to eat well because it feels good and allows them to live a full life not just for that number on the scale. Well-Balanced Nutrition is more than a plate; it’s a way of life. If you have sat down with Kristen or Lucy, you know we talk about much more than what you eat. We ask about who buys and prepares the food, what your typical day looks like, how much sleep you get, your stress level and so on. We even take note of your personality, attitudes, and beliefs. 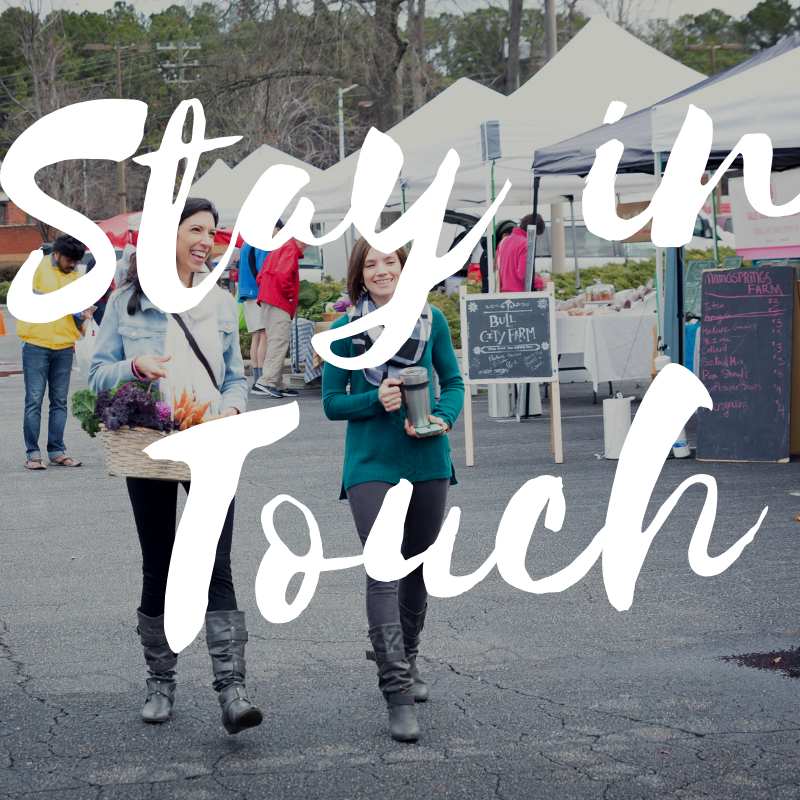 We consider all these things when we work with you to create a well-balanced plan. Each of us comes to the table with a different story, but we all have a desire to be our best selves. To sum it all up, well-balanced eating means ditching the diet mentality where foods are either good or bad, clean or dirty. Restriction, shame, and guilt should not be the norm. Instead, shift your focus to eating more natural foods and tuning into your body and mind. Eat mostly plants and do something every day that makes you feel good and can help you live your best life. Posted in Wellness Wednesday and tagged Well Balanced Eating, whole grains.